160 1939 January 1939 Feb. 1939. Mar. 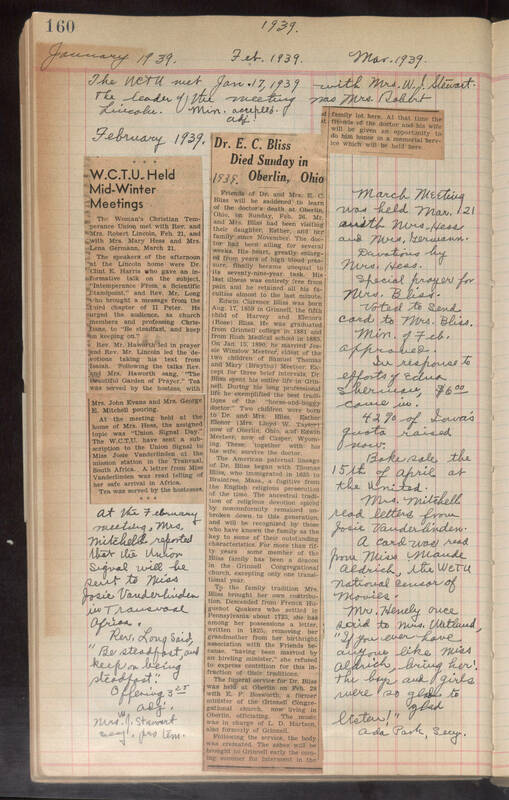 1939. images-2 newspaper clippings on right to center of page The WCTU met Jan. 17, 1939 with Mrs. W. S. Stewart. the leader of the meeting was Mrs. Robert Lincoln. min. accepted. adj February 1939. At the February meeting, Mrs. Mitchell reported that the Union Signal will be sent to Miss Josie Vanderlinden in Transvall Africa. Rev. Long said, "Be steadfast, and keep on being different." Offering 3 25 adj. Mrs. W. J. Stewart Secy. pro tem. March Meeting was held Mar. 21 with Mrs. Hess and Mrs. Germann. Devotions by Mrs. Hess. Special prayer for Mrs. Bliss. voted to send card to Mrs. Bliss. Min. of Feb. approved. In response to efforts of Edna Sherman, $6 00 cause in 42% of Iowa's quota raised now. Bake sale the 15th of April at the United. Mrs. Mitchell read letters from Josie Vanderlinden. A card was read from Miss Maude Aldrich, the WCTU National consor of Movies. Mr. Henely once said to mrs. Watland, "If you ever have anyone like Miss Aldrich, bring her! the boys and girls were so glad to glad listen!" Ada Park, Secy.